Nano aquariums are very popular because they are more affordable and saltwater fish enthusiasts can keep saltwater fish in smaller and cheaper aquariums. Due to the fast growing market, many companies produce specific products such as Nano protein skimmer. Whether you need a protein skimmer for a fish tank or not is determined by the type of tank. If you have a saltwater aquarium, you would definitely benefit from a protein skimmer because of fewer water changes, nitrate levels remain low, and the skimmer will oxygenate the water to a very high level, which is useful for the beneficial bacteria (that use oxygen) that break down ammonia and nitrite into nitrate. A protein skimmer is beneficial if you keep various types of fish because it will ensure the water is clean. There are some saltwater aquarium hobbyists that don’t use protein skimmers and their tanks do just fine, but using a protein skimmer really helps with easier maintenance of the tank. When the amount of water is small, such as in a Nano tank, it gets polluted easily and that could be a problem. The Nano protein skimmer for Nano saltwater aquariums can help to correct this issue. What is a Nano protein skimmer and how does it work? A Nano protein skimmer is a device that clears the water of waste before it decomposes into nitrates and other nutrients. Freshwater aquariums do not benefit from a protein skimmer because the waste molecules do not really attach to the air like the waste molecules in the saltwater tank; they are air driven. When air is introduced into the protein skimmer, it attaches to the air bubbles, which makes the water form a thick foam that exits the tank through the Nano protein skimmer pipe and into the waste container (collection cup). The foam is filled with waste molecules that end up in the container. The waste adds up and that’s why the collection cup needs to be cleaned over time. It’s transparent so you can see the amount of waste that builds up and know when it needs cleaning. There have been a lot of different designs over the years, but recently almost all of the Nano protein skimmers use a needle wheel/pinwheel, which has an impeller to mix together air water into a dense foam. There are also Nano protein skimmers that need an additional air pump, but they are less present in the market. All Nano protein skimmers are low-powered and small in size, which can fit easily into the sump of the Nano tank. 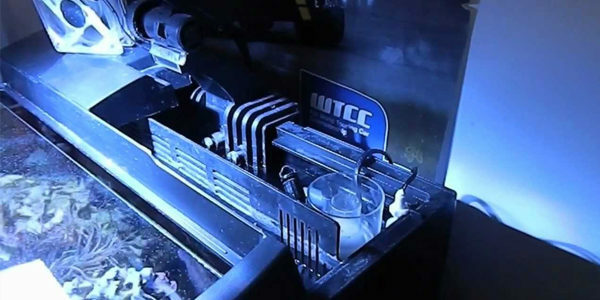 The sump is the compartment of divided space behind the Nano fish tank; if you don’t have a sump, it is very useful to buy or make one yourself because it hides the equipment and it’s a great way to put your devices needed for the saltwater fish tank, such as the aquarium heater, filter, Nano protein skimmer and other useful equipment. Here are some of the best nano protein skimmers you can find in the market today. What about the corals? Can they suffer from low nutrient levels? The corals feed on organic nutrients and since the protein skimmer’s purpose is to remove waste, hobbyists question if the protein skimmer is too powerful and will remove all the nutrients. Actually, even if your protein skimmer is designed for a larger saltwater aquarium, it’s not possible for the protein skimmer to achieve a really low organic nutrient level in which the corals wouldn’t have enough food. Your saltwater aquarium will never be as clean as the ocean water, so you shouldn’t worry about the lack of nutrients for your corals. Furthermore, you can unplug the protein skimmer when you feed the fish and the corals if you want to make sure your corals get enough food. Nano protein skimmers are relatively easy to setup and for every Nano protein skimmer product contains a specific user guide. The maintenance is also easy and it primarily consists of cleaning the collection cup/waste container and making sure the device is working correctly and efficiently.